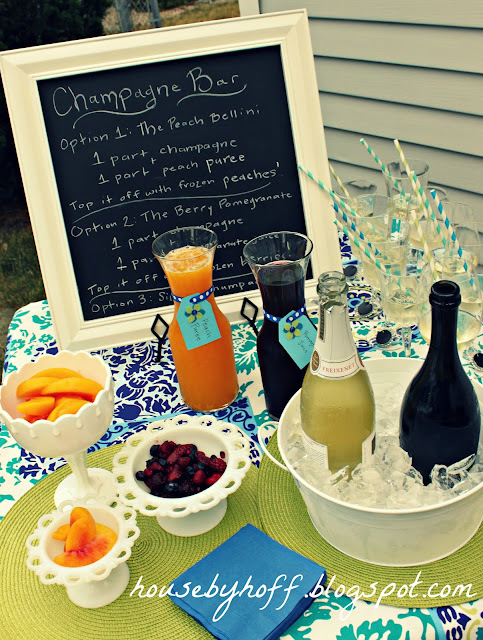 That makes it a perfect time to talk about a bridal shower that I, and my co host Jana, threw last summer for our longtime friend. I’ve had this shower displayed under my “party” tab for quite some time, but I wanted to write up a proper post on it. The bride-to-be, Laura, had chosen a simple and beautiful color palette of royal blue, green, and gray. She has great taste. (She and I showed up at another shower recently with the exact same outfit on…so she must have good taste, right?) We decided to stick with a similar color palette for the shower too! 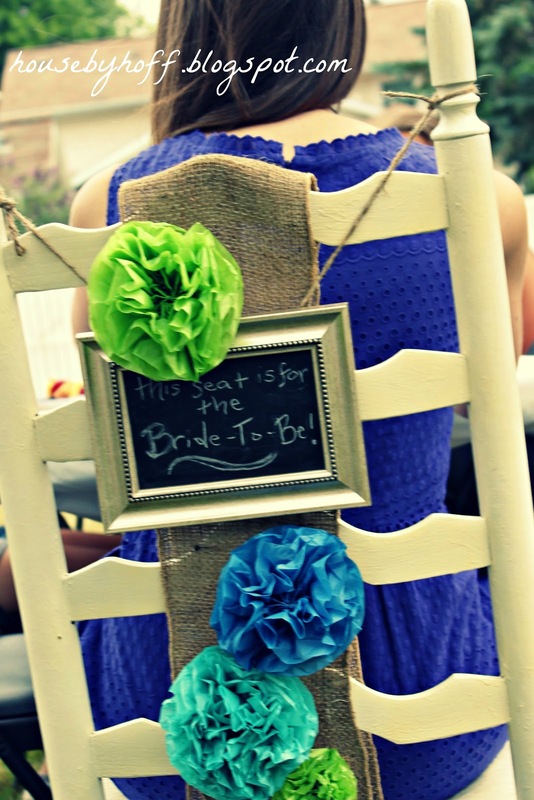 This little project was one of my favorites and made a perfect chair for the guest of honor. I simply attached tissue paper flowers to this thick burlap ribbon and draped it over a the chair to create a gorgeous decoration. I turned an old picture frame into a chalkboard (using chalkboard spray paint) and placed it over the burlap. 1 part Champagne + 1 part Peach Puree (I blended canned peaches…juice and all and added simple syrup to sweeten the puree.) Top with frozen peaches! 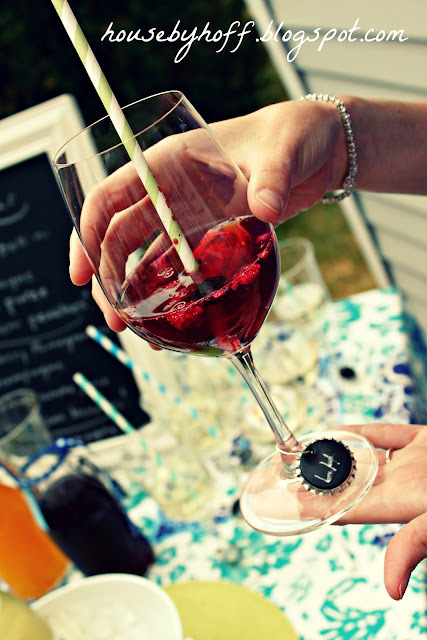 How cute are these little bottle top wine glass markers? Jana used chalkboard paint to paint the top of the bottle top. She then drilled a small hole and added a wire loop. 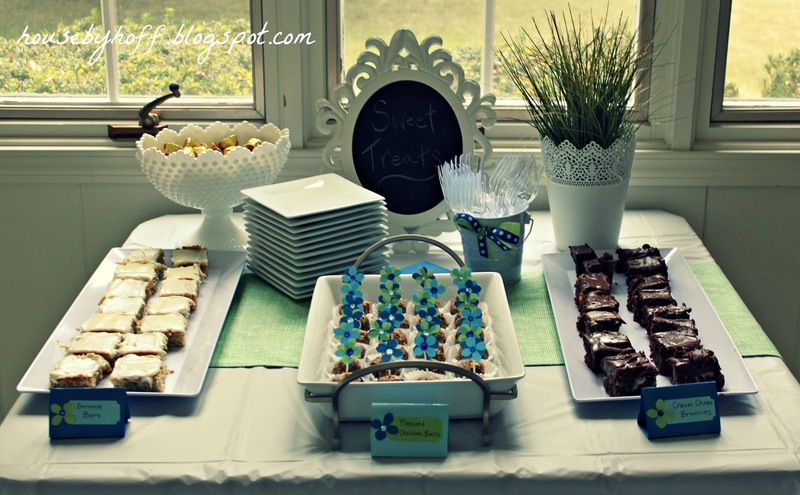 Our “Sweet Treat” table. For the Energy Ball recipe and directions on how to make the hydrangea toppers, click here. 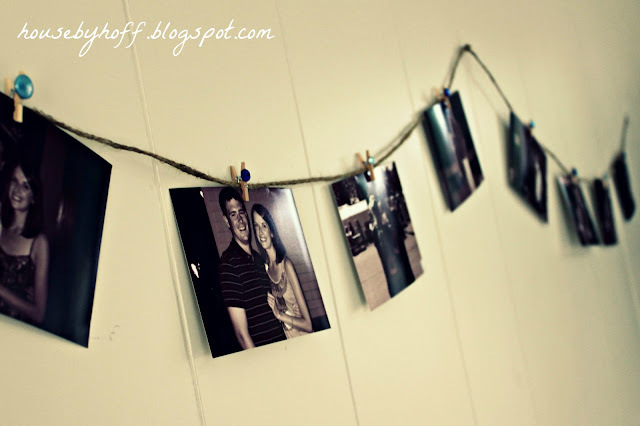 A photo display of the cute couple! 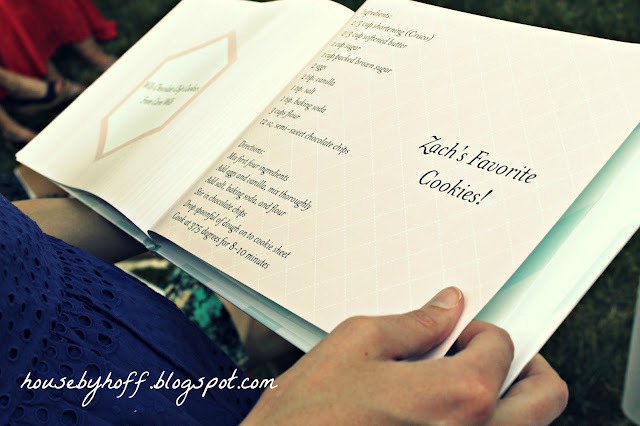 Jana also put together this recipe book using Shutterfly. Each attendee submitted a favorite recipe or two to share with the bride-to-be. Miss L. and her buddy, Miss H. They have changed so much since last summer! 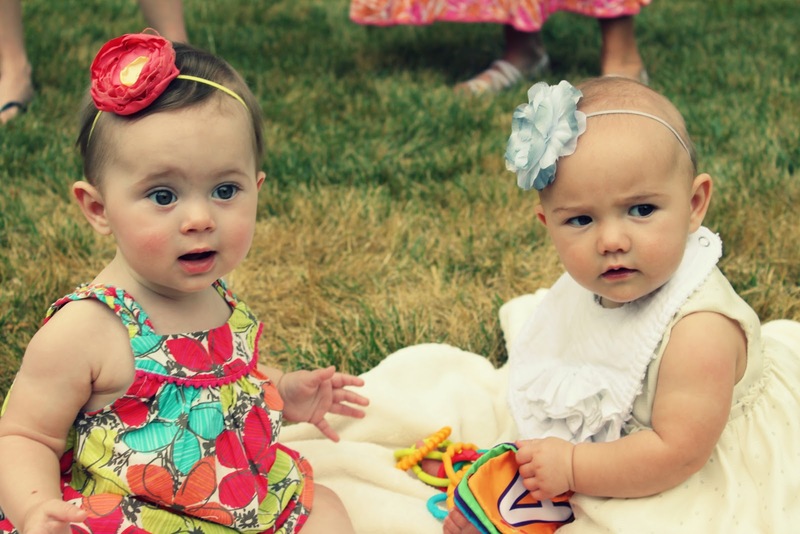 We like to say that they were discussing head bands. 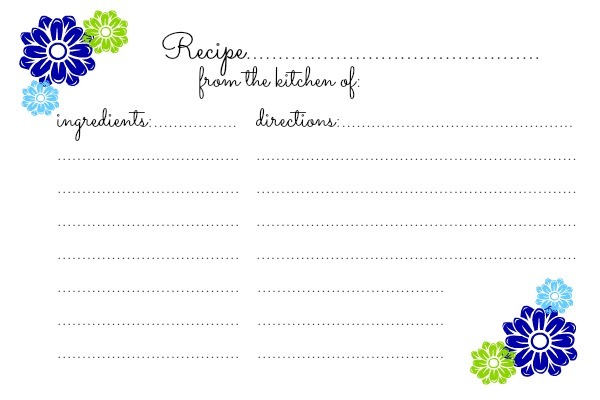 I’ve created a floral recipe card inspired by the shower colors. Feel free to use for a shower or your own personal use! It downloads as two 4″x6″ recipe cards. I’m throwing another bridal shower this summer for my sister. Any great ideas that I should know about? Previous Post: « I Heart Bloomington! This is so great! I have a shower to plan so these ideas are perfect! Pinning! Thanks for sharing! Seems like so much fun! Those babies are just precious! Email me at rainonatinroof01@aol.com with your banner info! I love your ideas! Especially the little glass bottle top markers. 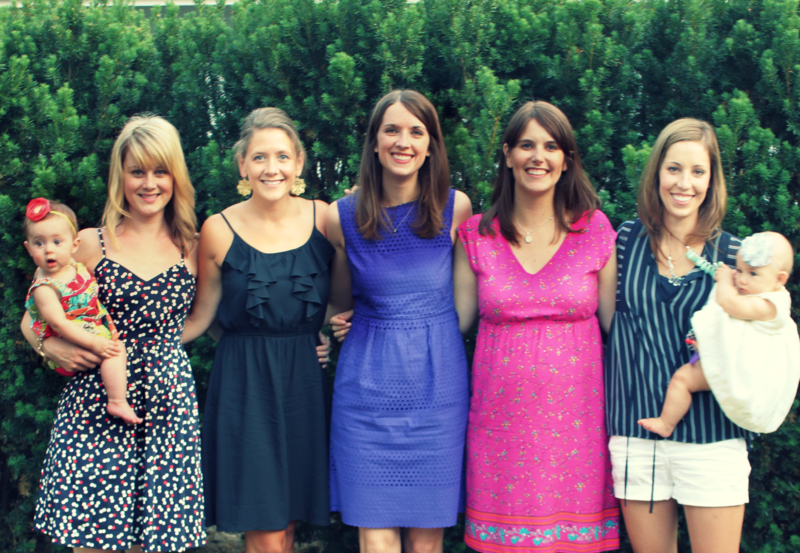 One of my besties is getting married in June and her MOH and we need all of the ideas we can get!